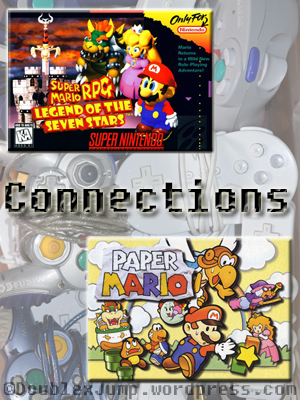 It’s not much of a secret that Rachel’s favorite video game is Paper Mario for the Nintendo 64 while mine is Super Mario RPG: Legend of the Seven Stars for the SNES. Both of those games are dear to us, considering they’re both probably the games that we each picked up on our own when we were old enough to hold onto the controllers and read the stories. While this has been known to both of us for quite some time, we were talking about it the other night and realized how… funny? Coincidental? I don’t know… How weird it is that those two games happen to be our favorites. We both grew up with video games, taking on the mantel of gamer when our uncles, father, and older sister stopped picking up controllers. I had watched our relatives play games on the original NES before picking up games myself on the next generation console. Rachel did the same, having watched me play the SNES before playing on her own on the Nintendo 64. We were amused at how we each started playing a console generation apart. Meanwhile, the first game Kris played and beat on her own was Super Mario RPG while for me it was Paper Mario. Both games are similar to each other as Paper Mario isn’t a “sequel” exactly, but it’s still a successor of RPG. I believe, originally, Paper Mario was going to be a sequel to RPG, but there was a bit of an issue on some character copyrights. Still, I consider them to be in the same series, if you will, as both promote the role-playing elements of party members, overworlds, and — of course — the aspect of collecting seven stars. I’ve always loved watching Kris play Super Mario RPG, too. Then when Paper Mario came out… I still watched her play it first (I think) because I love just watching, but I fell in love and decided to try it for myself. And fell in love again. It’s funny how we love similar games, just one generation/console apart. If that doesn’t say “player one” and “player two,” then I don’t know what does. Did you find this as fascinating as we did? What’s your all-time favorite game and/or the first game you ever completed on your own? Let us know in the comments below! Show of hands, who thought the weekend went by way too fast? Despite how quickly the weekend has come and gone, I hope everyone had a good one and an awesome week ahead! This past holiday weekend I spent my time finally playing Pokemon Moon. I’m definitely enjoying it so far, having gotten past my third trial, and I’m severely missing the time off of work that I had to continue binge-playing it. Rachel and I will go into more detail about the games themselves once we both complete them, but I just wanted to share my thoughts about the changes going on in the franchise that I grew up with. Diving into the gaming world for me was like Alice falling into the rabbit hole. I was full of curiosity and totally enamored when I used to watch my father and my uncle play video games. It was a story that you controlled. The characters were puppets to the buttons and I was amazed that you could make someone on the television jump just by pressing A. A couple of years later, I was good friends with a pair of twins who fully introduced me to the world of Pokemon through Pokemon Snap. That year Mom and Dad got me my first GameBoy Color, complete with a trio of Pokemon Red, Blue, and Yellow games. For about twenty years, the handheld Pokemon games followed a formula that consisted of your character exploring a new world with new creatures to partner with in order to defeat the Gym Challenges, whatever evil team that was plaguing the region, and the Elite Four. Pokemon Sun and Moon threw that formula out the window, and while I’m enjoying the games, I can’t help but feel as if I’m missing something. Perhaps it’s too early in the game for me to tell, or maybe I’m just feeling particularly nostalgic for the older games that I grew up with. It’ll be interesting to see if Zelda’s Breath of the Wild, with how it’s going to be shaking up the Legend of Zelda franchise, will affect me in the same way. The NES mini recently came out to hit us older gamers in the gut with memories, while virtual reality is rising on the gaming scene. Now I understand when my dad, upon seeing the motion controls of Wii Bowling, started talking about the “good ol’ games” from the past, like the original Mario or Donkey Kong!